This is day 5 of Soulful Simplicity, a 31-day series through the month of October! If you missed the first few posts in the series, you can check them out here. Thanks for taking the time to spend a few minutes here. What is the culture of your home? Have you ever stepped back to see how everyone interacts with each other, how your home systems work (or don’t work) for the benefit of all, or who sets the overall tone of your home throughout the day? Is there peace, or discord? Are your kids happy to help or apathetic about contributing their efforts to the household? Is there effective communication between family members, or is everyone disjointed and disconnected? These are a few of the questions I ask when it seems like we’ve gotten off the tracks at our house. Family culture is closely related to the pursuit of simplicity within the home because if the culture, systems, and relationships in your home are full of frustration, disconnection, and distraction, all of the above will have a significant impact on what kind of success you can hope for in pursuit of soulful simplicity. In the course of my journey, I have recognized that my own attitude is the single biggest factor in the current condition/culture of our home. I happen to be the at-home parent, and as such, have the greatest amount of influence regarding the tone of our home. When I am engaged, patient, and providing adequate leadership to my kids, I can gain a lot of ground in many different areas. When I am tired, distracted, annoyed, or impatient…it doesn’t go as well. When I first discovered this pattern, it wasn’t my favorite realization. I wanted to blame the chaos of our lives on everything and everyone else, and learning how to take responsibility for the role I played was not all that fun because it meant that I had to figure out how to stay on target a lot more of the time. As I have journeyed forward, however, I am glad for the gentle and patient nudges from God to slow down, dig deep, and give the best of myself to my family–whatever that happens to look like at any given time. 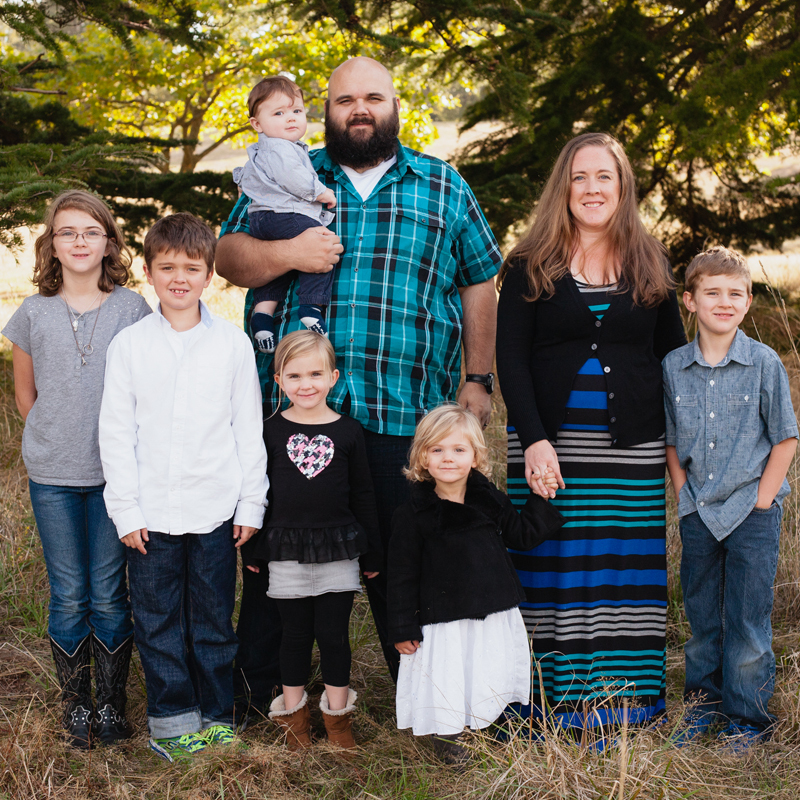 For me, taking this role seriously means I look for strategic ways to boost the morale among my children, sow encouragement into their hearts and teach them how to do the same for their siblings, smooth out household systems that may not be working for us, and make sure I’m communicating well with my husband so we can stay on the same page. 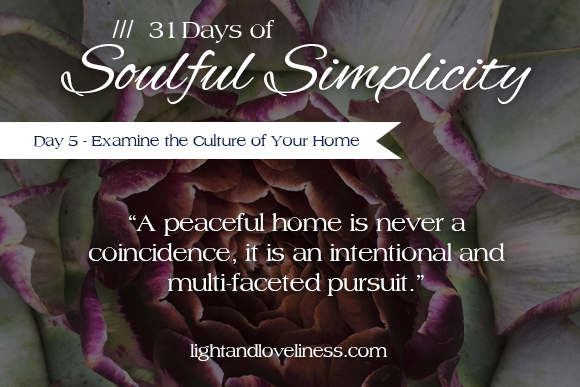 A peaceful home is never a coincidence, it is an intentional and multi-faceted pursuit. I want to put a few strategic ideas out there that may help you wherever you are in the process of nurturing your family toward soulful simplicity. Give your kids opportunities to show you how capable they are. I look for ways to help my kids discover what they are capable of and hold them accountable to their ability. In practice, this means I include them in household tasks as appropriate. My current two year old does quite a few chores alongside me. She isn’t an independent helper yet, but I invite her to join me in what I’m doing and there is rarely a time that she chooses not to willingly contribute her effort because she loves feeling included, and she loves being useful. Within time, she will be able to do these tasks without my help. This contributes to peace within our home because little hands are busy with constructive things, and the help really does amount to a lighter load for me, especially when all the kids help in the various ways they are able. Cultivate connection and communication with each member of your family, and I would add, cut out whatever you have to in order to preserve both of these things. I often tell my kids out loud, “You are an important part of our family,” and I thank them for their specific contributions in household tasks. I think children thrive on feeling a sense of purpose within a family system, and when I affirm the value of their work, and recognize the effort they put into including and encouraging their siblings, it bolsters their internal motivation to continue developing those habits. This process does require time and patience, but the investment produces a great return if you stick with it. If your schedule is so full that you are feeling disconnected from each other, make a change. Build space into your week that is scheduled just for connecting and conversation. Whenever it is possible, work, play, and rest together as a family. Time together is priceless, whether it is work, play, or rest. One of my favorite recent memories of my crew happened while all of us were sorting and folding a huge mountain of clean laundry together. I don’t remember how it got started but someone started laughing about something and before long, we were all laughing our way through the pile. Absolutely the most fun I’ve ever had doing laundry. One of the greatest gifts you can give your children is your presence…both your physical presence and your attention. You don’t have to be doing “fun” stuff at all times. You can invite them into your tasks, projects, dreams and rest, and see your family culture take on a new facet as you work together in the same direction. Thanks Virginia. I appreciate your encouragement.